ring US dollars to pay for it. A lot of cards don’t seem to work over here. Yes, noticed that about cards last March when in Chile. Yet in Argentina no problem anywhere. 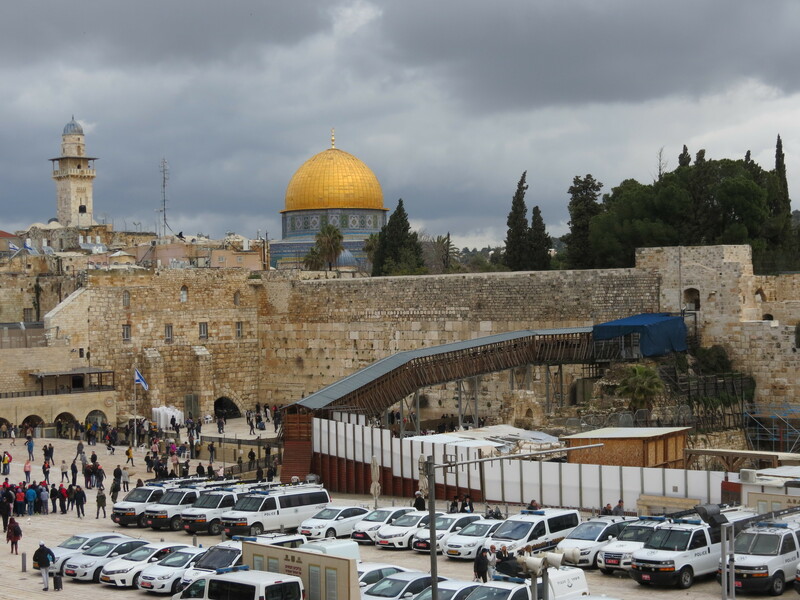 Arrived in Jerusalem yesterday and appropriately the heavens opened, torrential freezing rain all day. 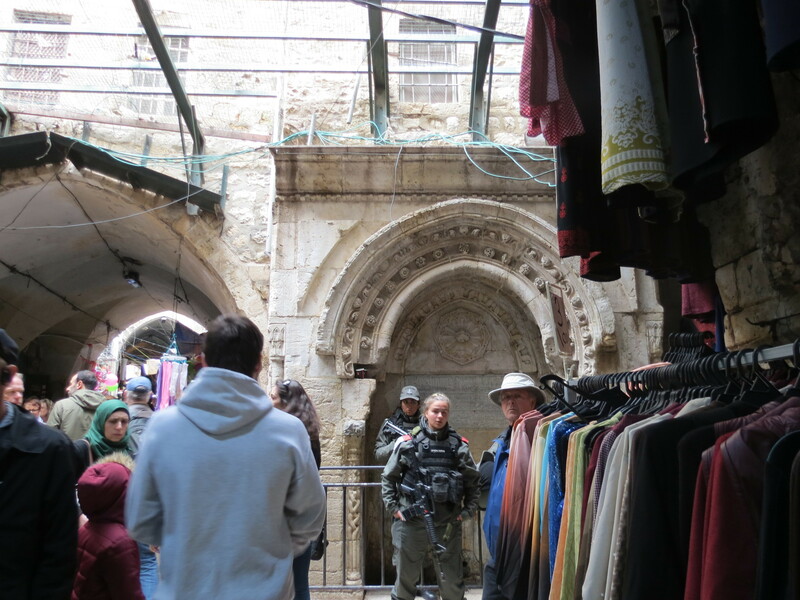 Drier and a bit warmer today and had a very pleasant time getting lost in the streets of the old city. Mystical and evocative and very commercial, if that’s possible. 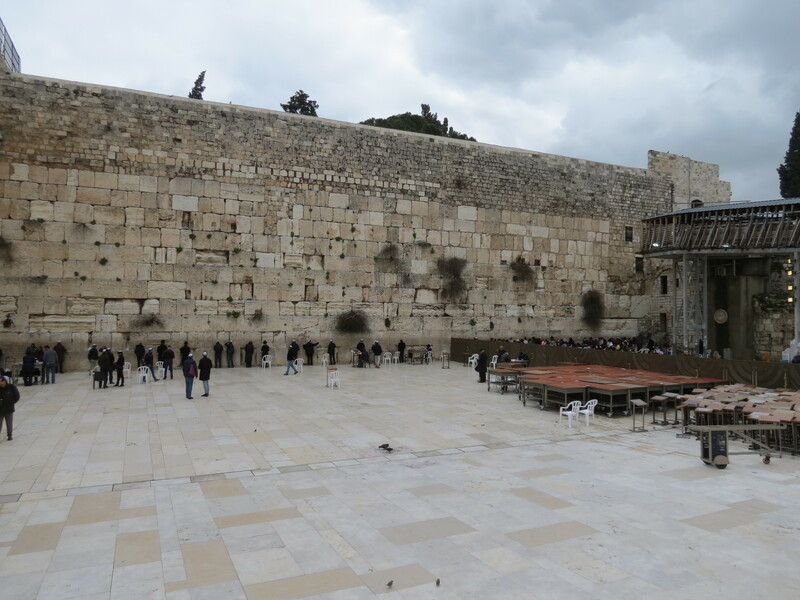 The compact crowded section to the right behind the barrier is the women’s portion of the Western Wall. I imagine male prayers need more space to spread out, or something? 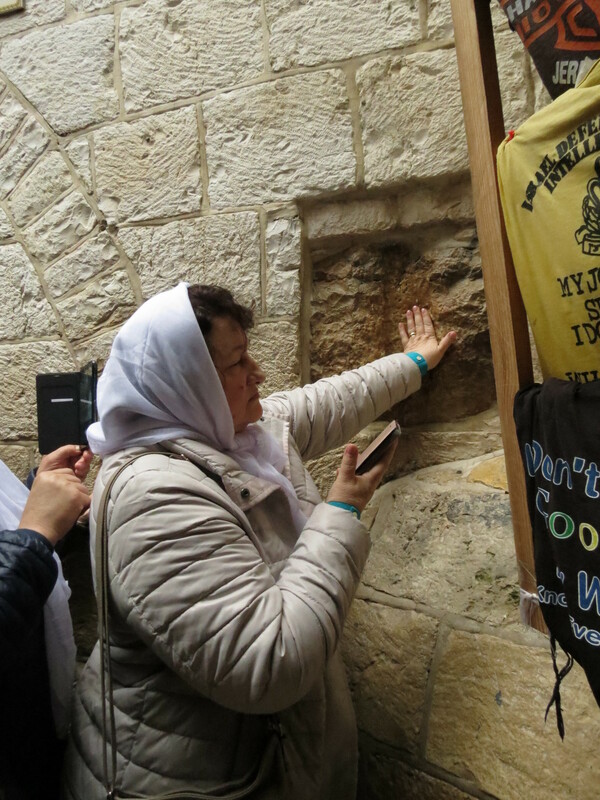 Sacred hand selfies on the Via Dolorosa. Praying to a pile of stones. Humans are quite sad really. 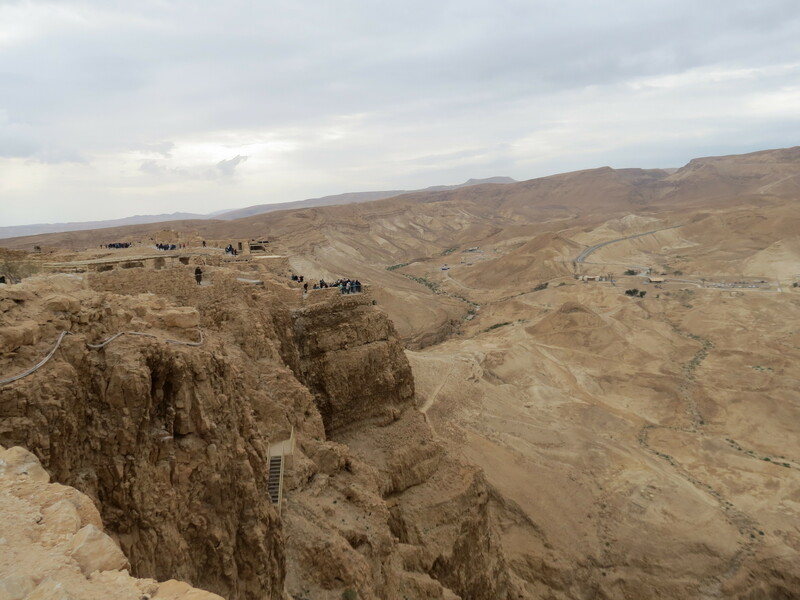 If you’re coming to Israel don’t miss Masada, so incredible not even the logistics of a group tour could spoil it. Our first organised day tour of the hol clocked in at around 10 hours, one and half hours of which was mind boggling which made up for the boring lectures (at least I could turn off the hearing aids and duck off regularly), lots of waiting around in queues and hotel pickups and drop offs and a forced visit to a Dead Sea Cosmetics store. 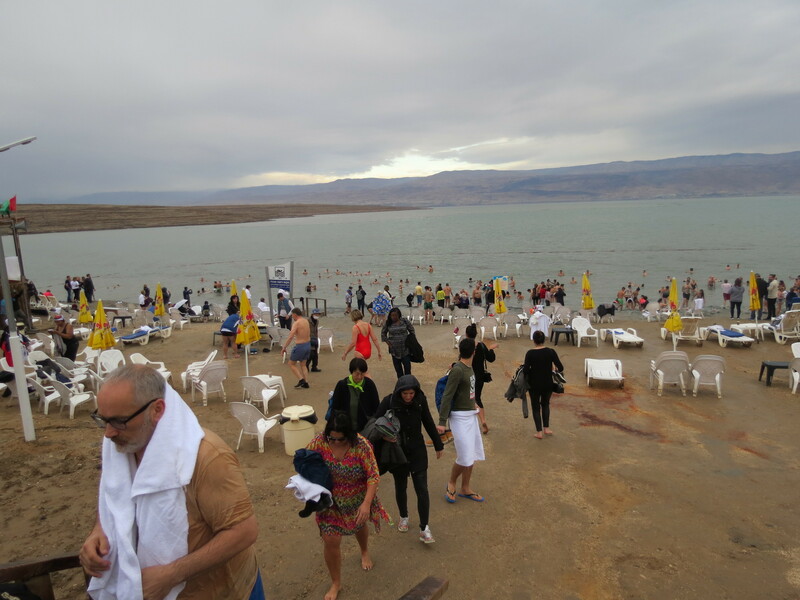 We could and should have taken the bus from Jerusalem and just gone to Masada but we were sucked into the Dead Sea thing which turned out to be a dead loss, a beach located in what appeared to be an industrial waste site full of expensive cafes and people in togs and covered in mud. Very few were easy on the eye, unlike Masada. The drive to and from was great though, spectacularly stark landscape. 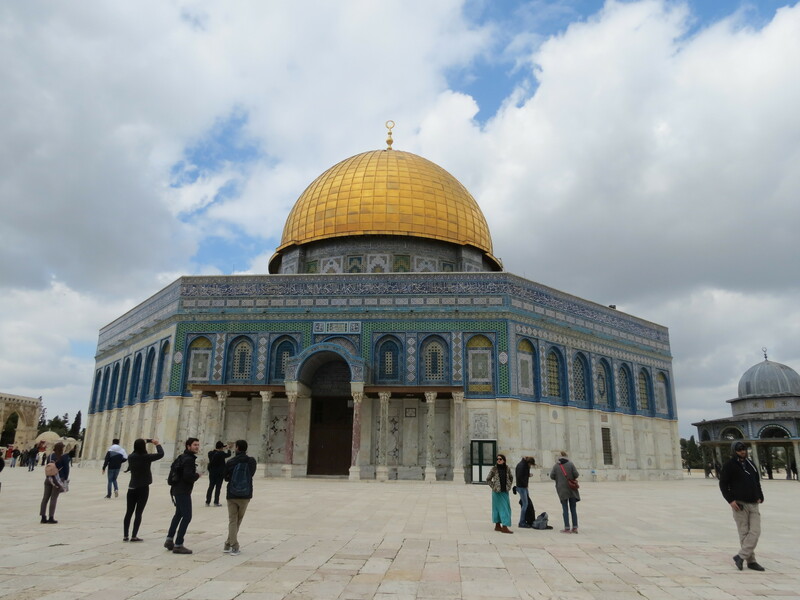 Back in the Old City today and stood in line for over an hour to enter Temple Mount and view the Dome of the Rock up close. Worth every aching muscle, up there with the Taj Mahal as a visual eyeful. And another in the girls and guns series. They are literally everywhere. Weird feeling to have my passport checked on a bus by a teenager while the barrel of her dangling semi automatic was pointing at my kneecap. Off to the West Bank tomorrow and then back into Jordan. Our travel insurance is void for the day apparently. 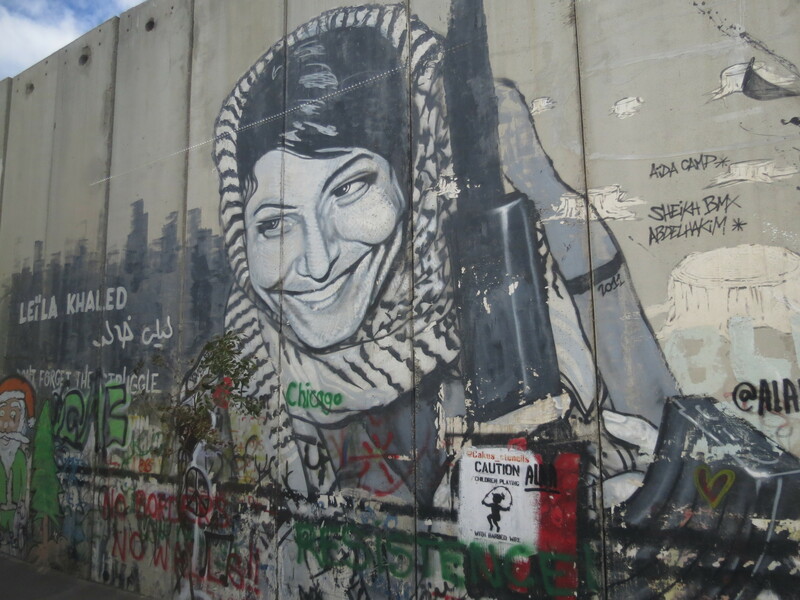 Some West Bank pics. 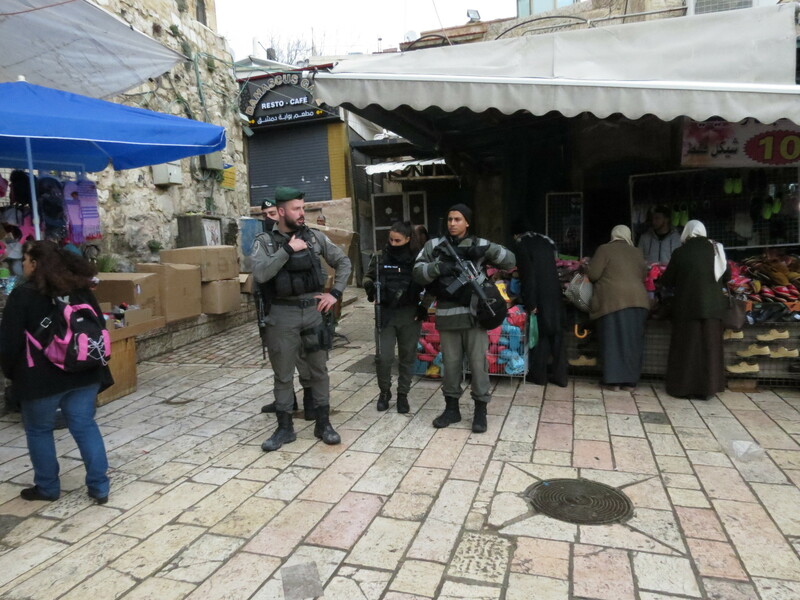 Seemed quiet enough to us but we later learned 2 Palestinians were shot and killed after what the Israeli police described as a car ramming in the Northern part and they expect more trouble in the lead up to the Israeli elections. 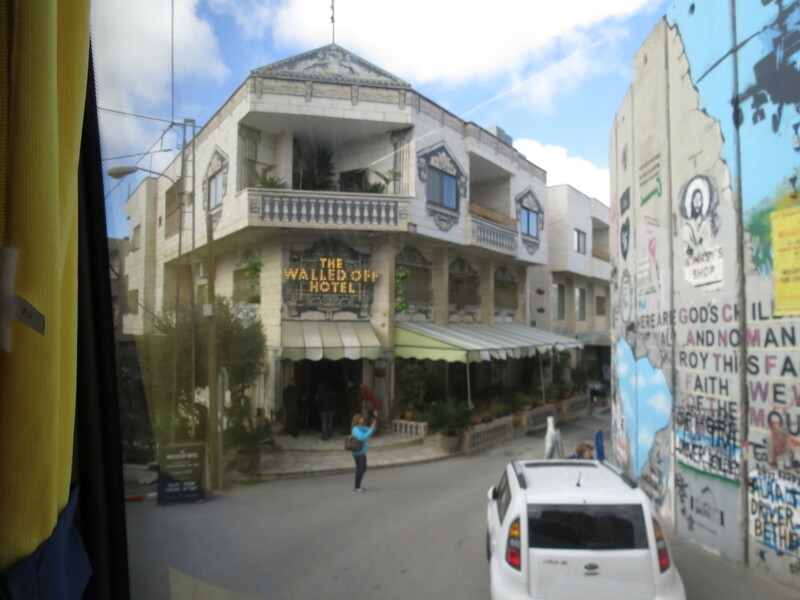 A night in Banksy’s hotel will set you back nearly a grand I’m told but the proceeds go to the locals and he has helped turn the world’s ugliest wall into a working canvas. 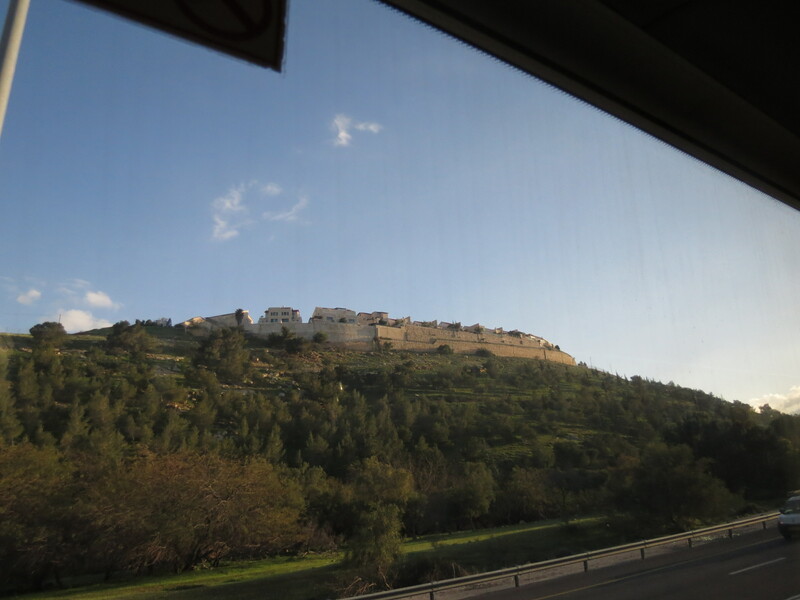 An aesthetically and politically ugly bus pic of one of the many Israeli settlements in the West Bank, nearly all of them perched on hills and heavily fenced. 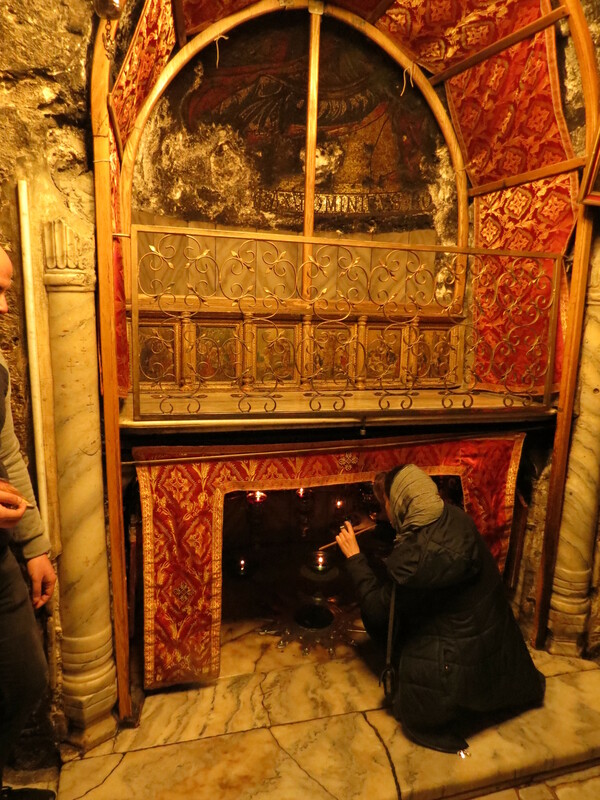 Despite the troubles there are plenty of tourists, most of them religious, and they nearly all come for this underground chamber in a gorgeous orthodox church where they often wait 5 hours or more to get in. We’re not religious so fortunately we got lucky and our wait was only 30 minutes. Something about the original site of a birth in a barn. PS Just crossed back into Jordan via the Southern border crossing at Eilat/Aqaba and can confirm that Trip Advisor is more reliable than the official sites because you do get a visa on arrival for free providing you stay 3 nights, even if it’s your second crossing, as in our case. Scoot are Singapore Airline’s LCC in the same way that Jetstar is to Qantas. Their aircraft are well maintained and are a mostly new fleet and operate to the same high safety standards so no problem there. They use new 787 Dreamliner’s for long haul which are excellent and their seats by all reports are quite comfortable even if a touch smaller than on a full service airline. Being a LCC there is also no food, beverages or entertainment provided unless you pay and the same goes for baggage. I know a couple of people who have used them recently and reckon it’s a better experience than flying economy with Qantas or even Cathay. Just take an iPad and load up some movies. So Melbourne, Tokyo, Vancouver, New York, Orlando, London, Lisbon, Dubai, Melbourne. Some will be flights, others train. Too much for one trip? Thinking 6 / 8 weeks. Haven’t looked too deeply into pricing yet. Some legs may book locally as well as opposed to one ticket encompassing it all. How many days in each place? How long have you allocated for Tokyo? No room for Kyoto? You’ll need a heap of time for London and NYC. Never been to Orlando or Dubai. Melbourne is where my soul lives but Tokyo is where my heart lives so I always try to return there! Done Kyoto last trip too so we can rest that one till post Olympics. Never done London or New York so wanted to see these other big cities. Lisbon is to see family and for my partner to see a bit of my heritage. Orlando is purely for Kennedy space centre. This is a bucket list item. Vancouver is for the Rockies and the Rocky Mountaneer train mainly. Dubai is a good stop on the way home. Wondering which direction I should go in (as in clockwise or anticlockwise)? Yeah, Scoot is fine. Wifey and I used to get from Bali to Singapore last year. Was comfy enough even though I’m a big fella. As Ace said, load up on entertainment, snacks etc (or be prepared to pay extra) and all good. Yes, started to write a report, but just would have reiterated what Aceman said. “Cheap and cheerful” but I would only fly with them in what passes for their J class. (and even then you have to buy drinks etc or at least that was my last experience). OK, calling on BB’s band of esoteric travellers: anyone with tips for best ways of getting to the Shetlands and what to do/where to stay there? We will probably go after spending a couple of weeks in Tuscany, then returning to AUS via LHR. Having done both the main ways there I preferred the overnight ferry from Aberdeen. It is a 12-14 hour trip but if you get a cabin it’s quite comfortable and you get some pretty good scenery. You can also take you car over if you wish to drive around over there. Things may have changed but the only flights to the Shetland Islands was from Edinburgh or Arberdeen and were about $140 one way at the time. Plenty of accommodation options we found a lodging by visiting the Shetland tourism website but Airbnb is pretty popular over there and plenty of homestays, lodges or pubs with rooms. The weather can change at any minute so be prepared (we went in the middle of summer and it snowed for 2 days straight) The wind can be horrendous aswell. 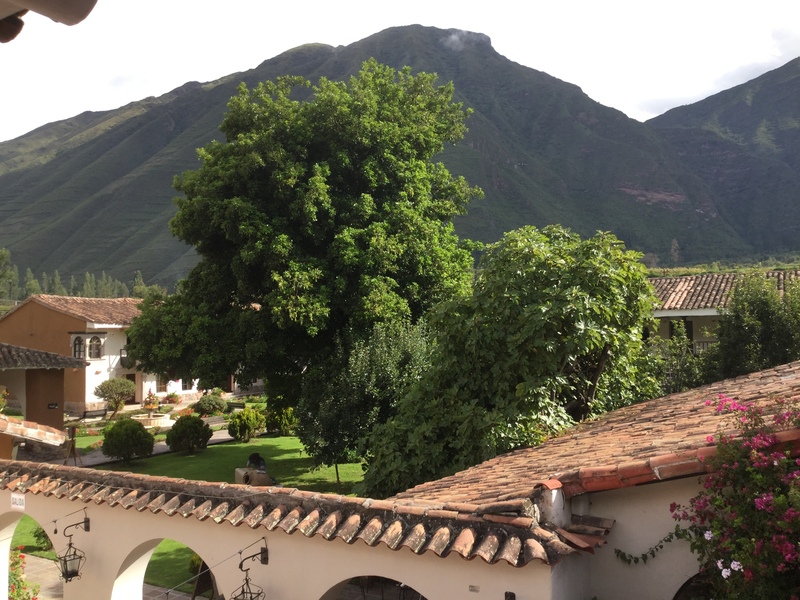 Glorious morning here in Cusco. Just a pity I woke up at 4.30am to follow the JLT game! Aqaba beach scene. Reckon the lads have the better deal. PS There were a handful of women in conventional one piece costumes nearby but they were Europeans. I have learnt not to do that anymore on holidays.